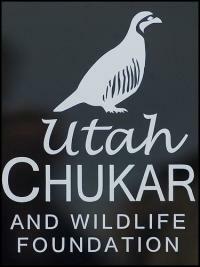 The Utah Chukar & Wildlife Foundation Store was set up to help all wildlife. The revenue from these sales will aid in wildlife conservation, habitat restoration, and wildlife academia; and it’s a great way to show your support! Just click below on the items you’d like to purchase and then checkout through Paypal; its easy, safe, and you’ll feel great knowing your support will help fund future wildlife projects in Utah. 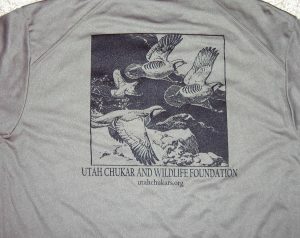 Great looking cotton shirts with the UCWF logo on the front and a flushing covey of chukars on the back. 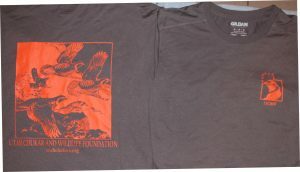 Shirts come in Olive, Grey, Green, Orange, Sage, or Rust in sizes Xtra-Large, Large, Medium and Small. Same great looking design as the cotton t-shirts but shirts are made of Dri-Wick material. Dri-Wick is prefered by most outdoorsmen. Shirts come in Tan and Olive in various sizes. The same great looking cotton shirt but with long sleeves for those cold winter days. 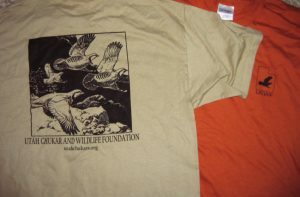 Same UCWF logo on the front and a flushing covey of chukars on the back. Long Sleeve Shirts only come in Grey. Similar design as the short sleeve Dri-wick shirts but has the new style logo on the front. The Dri-Wick material is preferred by most outdoorsmen. Shirts come in Charcoal and various sizes. Be seen on the chukar hills touting this great looking camo hat. 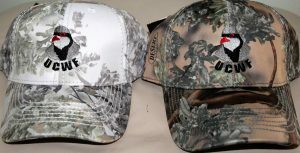 In conjunction with King's Camo, we have included a fine hat with a embroidered UCWF logo. 1 size fits most and comes in white camo. $15 Each. We have some new auto decals available for you to display and show your support for the Foundation. They are 6x9 and are available in white. Let others know you support sound wildlife conservation by placing this decal on your vehicle. 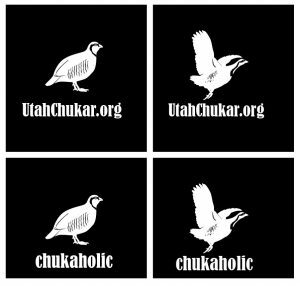 Utah Chukar & Wildlife Foundation decal (WHITE), long lasting vinyl.